3) What is the evidence to support/challenge someone/something that is being suggested/presented as a solution or fix to a problem? 4) What makes up the evidence itself? What is/was the methodology, approach or method(s) for the research? What were the sample size(s)? How was a control group used? Who was surveyed and do they represent the people/context/work that I am now doing? Whose judgement/experience is being used for the basis of that/the decision? If ‘this’ has worked (here) before what are the factors that contributed towards or enabled that result? In an age where we are presented with information and data all the time, from many sources it can be easy to take things at face value. An example would be the debate that is happening about the role(s) of Facebook and ‘fake news’. I am also a huge advocate of curiosity as a core practice and principle about how modern work needs to be. Curious about what it behind, within, around stuff that is happening so we have a richer/fuller picture. Holding that curiosity beyond a slide full of references. A list of references does not necessarily equal evidence**. Take work on the “Growth Mindset” as an example. A lady called Carol Dweck is a core proponent of the growth mindset and it’s ability to distinguish between those that perform well and less well. My challenge, her research focused on students completing mathematical tests/problems. Are those findings therefore generalisable across to people that are learning how to sell cars or answer customer problems or learn a process/procedure? 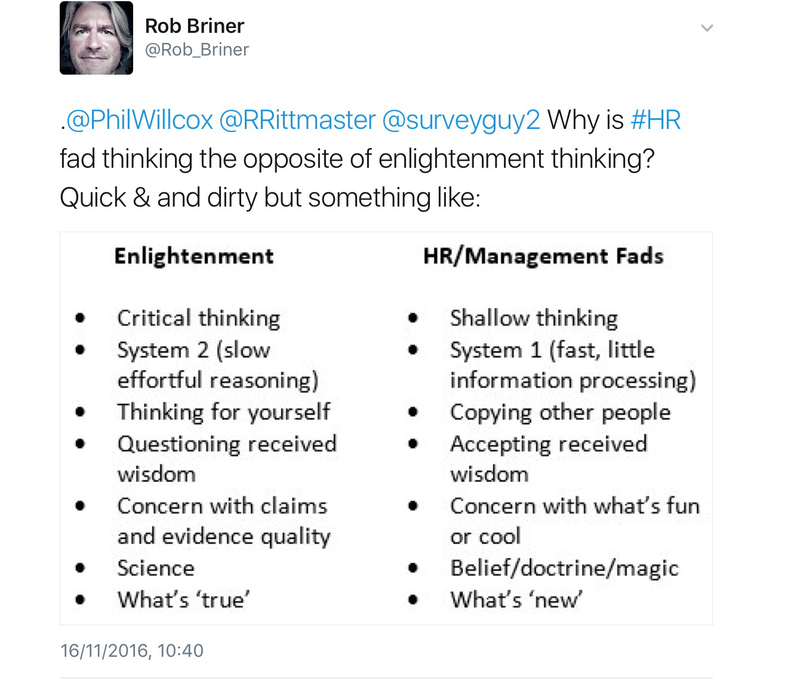 I was on Twitter last week and chatting with Rob Briner (@Rob_Briner) about ‘HR/Management fads’ and what he called ‘Enlightenment thinking’ and it got me really cross. To the extent that I didn’t want to respond in less ≤140 as I think it would have been destructive and unhelpful. I also wanted to reflect on what got me so annoyed. The frame that was put around the discussion bothered me. By saying there are two varieties and one of those is ‘enlightened’ didn’t sit well with me. The word implies superiority, wisdom, being intellectual. By placing it in contrast with another thing (fads) it implies that fads are the opposite of those things, inferior, naive, being thick. The use of shallow, copying, belief, little (information) processing, accepting, magic and doctrine all trigger me. They trigger me because they create an impression (in my mind) of some blundering ‘yes person’ that changes direction with the wind and cannot think for themself. By framing it as ‘HR Fad Thinking’ in the tweet, the implication is that this is the way HR (as a whole) thinks. I don’t appreciate that generalisation across the whole profession, that I am part of. If you asked me do I want to be a person that does all the things on the right, no. But also if you asked me if I want to be a person that does all the things on the left, no. Because the impression created by that list is someone that continually challenges, that cannot operate at pace, is more bothered by evidence than practice and if it cannot be proven then won’t engage. I get that I am creating these images in my mind and that this is MY meaning. Just because it is my meaning, it doesn’t indicate others find the same meaning as me. I’d be fascinated to know what meaning you get from the visual above. A large amount of my work in around change and part of making change stick is redefining what makes for ‘credible’ in an organisation or sector or profession. One of the troubles with credibility is that it is defined by actions, interpretations and perspectives. A MD can say to a business ‘it is OK to make mistakes, mistakes are good, share them widely and openly, review and analyse them, if we all learn together and we can all perform better’*. Giving this permission though is not enough. It needs to be supported and reinforced by everyone in the company. As an example, all managers in the company need to encourage sharing and support mistake makers as if there is any indication that you will be told off or disciplined as a result of a mistake, people won’t share that they make them, they will hide. Likewise here, we can tell HR/Learning/OD practitioners to use evidence based approaches. We can give them the evidence that evidence based approaches are the way forward. BUT if the people that they work with; business leaders, managers, learners, consultants, colleagues, directors don’t perceive evidence based approaches as credible, the HR person leaves themselves at serious risk of losing their credibility with the people that matter most, the ones they have to work with. Look again at the list on the left in the image above….. think about the impression you have formed of someone using the things in the left column… then place yourself in the shoes of the directors or managers that you currently (or have) work(ed) with….. will they think that person is credible? Will they listen to them? In summary, we need to bring more evidence based approaches into the work that we do in HR and L&D. The WAY we engage in that process matters too. For me, if we take an approach that creates a dichotomy where one is shallow, a copycat and wants to be cool, and the other is a truth seeker, a scientist and self thinker does that help? My worry and feeling is that is does not help and in fact runs this risk of undermining the credibility of evidence based approaches and practitioners. I want to talk and work WITH the practitioners that use zero evidence based approaches at the moment. ** I realise that I am citing a list of authours and therefore that does not equate to evidence, if you want me to share links o books, papers and or resources around this, please let me know. You then need to go and interrogate those to see how valid they are and/or they are to you.